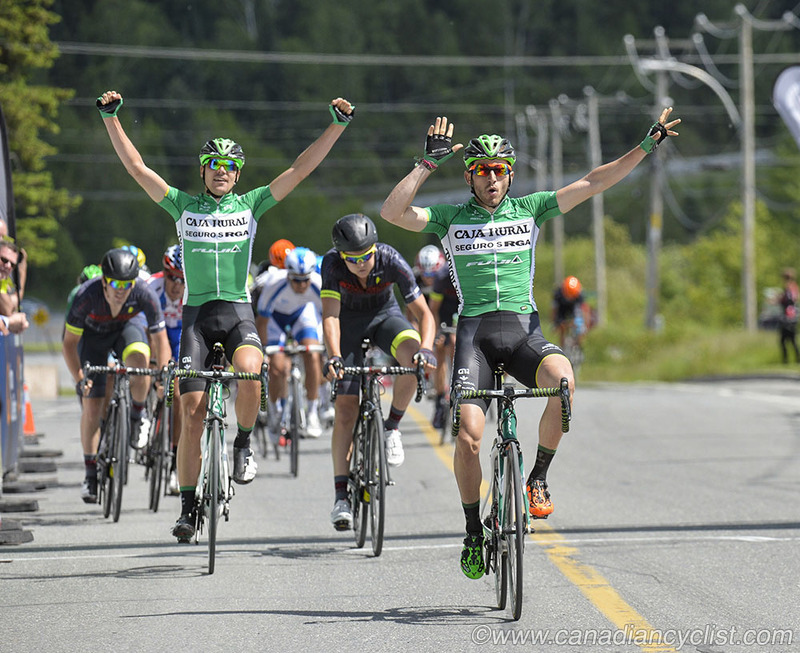 The 30th anniversary edition of the Tour de Beauce opened on Wednesday with a 1-2 finish for the Spanish team of Caja Rural - Seguros RGA, when Sunday's Philadelphia Classic winner Carlos Barbero Cuesta and Eduard Prades Reverter outkicked the rest of the field in an uphill sprint. Dion Smith (Hincapie Racing Team) took third. The 186 kilometre stage took the 141 rider field east and north of Saint-Georges, on the same circuit that saw Zach Bell (Smartstop) win the Canadian road title two years ago. After a rolling 30 kilometre run on rough roads - that saw many riders flat - the field did eight laps of a circuit with a 600 metre KoM climb each lap. Six riders broke clear of the field 20 kilometres into the race and were then joined by two more on the first lap. In the break were Oscar Clark (Hincapie Racing Team), Fernando Grijalba Perez (Caja Rural-Seguros RGA), Ruben Menendez Velasco (Inteja-MMR Dominican Cycling Team), Angus Morton (Jelly Belly p/b Maxxis), Rafael Montiel and Mauricio Ortega (Orgullo Antioqueno), Michael Le Rossignol (Silber Pro Cycling), Anton Varabei (Garneau Quebecor). The gap went as high as six minutes before Optum and Smartstop went to the front to pull it back. By the final lap the gap was below a minute and the Hincapie team of defending Beauce champion Toms Skujins put the final nail in the coffin with a hard attack over the KoM climb. As the riders headed back to St-Georges to finish only one riders was left at the front, Clark of Hincapie, and he was caught with 20 kilometres to go. Ryan Roth (Silber) tried an attack in the final kilometres, but was quickly reeled in, setting the stage for the finish - a sharp right and then 200 metre uphill kick to the line. The Caja Rural - Seguros RGA squad were perfectly placed, and Barbero and Prades were able to coast across the line with their arms in the air. "I felt great," said Barbero. I felt this finish was similar to Philadelphia, so I thought I could do well. I am very happy with this stage victory as the team worked so hard for us." "The guys knew I was good and we knew that the last meters of the finish, uphill, would suit very well with Eduard and me. It was a bit the same kind of finish in Philadelphia." Barbero now holds both the yellow leader's jersey and the Points Jersey. Dion Smith is the Best Young Rider, and Mauricio Ortega (Orgullo Antioqueno) wears the Climber's Jersey. Team Santé Universelle/Marin Bikes, established only in January by sports director Frederick Gates, had the top Canadian finisher with Jean-Sébastien Perron in 8th place. "Having a rider in the top 10," said Gates, "is the icing on the cake. It was only our second UCI race and we are thrilled with this eighth place. Jean-Sébastien is racing his sixth Tour de Beauce and brings experience to the team. The final was made for him with an uphill sprint." It was only in January that Gates had the minimum necessary sponsorship to run his team. "We wanted to give racers among us the opportunity to gain experience in UCI caliber races. Our budget allowed me to put the team in the UCI race in Saguenay, where it was our first participation at this level, and also the Tour de Beauce." To give more depth to his team, Frederick Gates went and acquired Chad Beyer, an American, who has already taken part in the Giro d'Italia. "At 27, he had difficulty in finding a pro team for quota reasons because of age. I spent a month in Arizona, and I noticed he won all his races. I inquired with Gord Fraser, and when he told me what Beyer had accomplished, I made contact with the cyclist. He agreed to come with us. 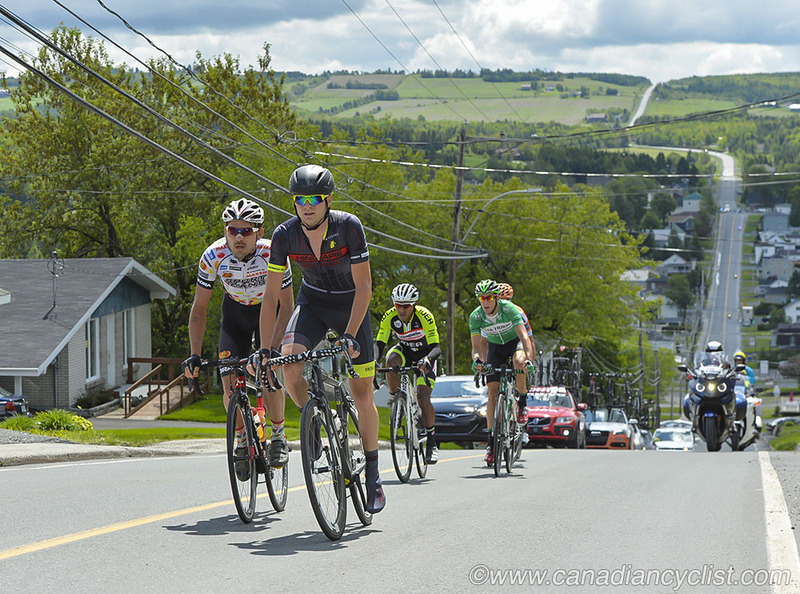 It is sure that participation in the Tour de Beauce can bring us in the news, and what we did today is also very good for us." Tomorrow is the Queen stage of Beauce, which finishes atop the 1000-plus metre Mont Megantic climb.